In 1976, engineer Steve Wozniak, while working at HP, built the Apple-1 computer from scratch. Together with Steve Jobs and Ronald G. Wayne, both working for Atari, he founded the company Apple Computer that would make history and change the world. Only 200 Apple-1 were produced in total. According to Steve Wozniak, 175 were originally assembled. Steve Wozniak designed the Apple-1. The motherboard was designed by Howard Canter – what not many people know. All Apple-1’s components were soldered in a factory. The IC chips were placed in Steve Jobs' parents' house. Steve Job's sister and Daniel Kottke equipped the mainboards. Steve Wozniak showed up once a week and corrected any mistakes in the garage. As soon as a few mainboards were equipped, those were sold to the Byte Shop. The first 50 Apple-1 were sold to the Byte Shop, owned by Paul Terrell, who met Steve at the Homebrew Computer Club accidentally. Without this contact, the Apple Company might not exist. have been the Apple Company. East Coast: Later Stan Veit bought an Apple-1. He was the owner of the east coast's first computer store. He showed this computer at the Association of Computer Machinery and first nobody believed him that the Apple-1 would be a computer. All Apple-1 came out without a case, keyboard, power supply and external storage device. There is NO serial number for Apple-1 computer! Some Apple-1 have a handwritten number on the back. In auctions this is often referred to as the serial number, but it is not. There are many theories surrounding this number. Only Apple-1 computers sold by the Byte Shop seems to have this number. But nobody remembers where the number really comes from. Steve Wozniak, Steve Jobs, Daniel Kottke, Paul Terrell, the board manufacturer etc. all say that they didn't put the number on the mainboard. However, all information pointing to the fact that someone in the Byte Shop wrote the numbers on the boards. But it might be a mystery forever. Only some Apple-1 of the first batch got this handwritten number. So far no Apple-1 of the 2nd batch have it. In addition to the handwritten number some Apple-1 computer have a small round stamp with a number in the middle. Others have small stickers on the back. The origin of these marks is also unknown. Those stickers are usually used in the factories. The Byte Shop theory seems plausible. Only one question remained: why do numbers greater than 50 exist? Mike Willegal found an explanation. 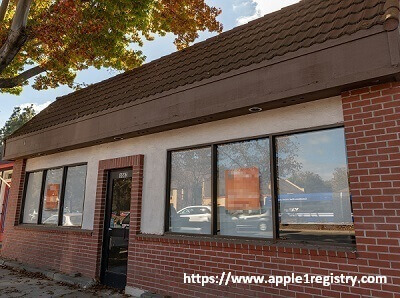 Data Domain Computer had purchased Apple-1 computers directly from the Byte Shop. Mike asked Thom Hogan (Data Domain Computer) about this. At that time, Data Domain Computers had found a practical application. One was at the Kentucky Derby. Ray Borril, the owner of Data Domain, bought 15 Apple-1. Probably more such deals were established. They sold 13 Apple-1, 1 was donated to the US Olympic tennis team and destroyed in a plane crash. The last one was auctioned in 2001. The sale of Apple-1 to Data Domain Computers by the Byte Shop explains the higher numbers quite well. In any case, there are computers whose handwritten number is greater than 50, but were still sold by the Byte Shop. That is not a contradiction. When the Apple-1 were sold to Data Domain Computers, probably just a few computers were taken out of stock and why would anyone pay attention to the ascending order of the numbers? Some Apple-1 have a sticker and / or stamp on the back or front. Nobody know the origin but usually it is used for quality control at manufacturing. Stamps are mostly found on the back under the power section or on the front next to the heat sink. Stickers are found somewhere on the back or sometimes on the breadboard area. So far the number hast two or four digits. Some boards even has two sticker. The 4 digit number has so far always been 4062. The handwritten number is always unique. Stickers with the same number are found on some boards of the 2nd batch. So far only Apple-1 of the 2nd batch have stickers sometimes. The Apple-1 was produced in two batches, the second batch was made by another manufacturer. Apple-1 of the first batch were built around April 1976. Those Apple-1 of the first batch are the first produced Apple-1 ever and the oldest one. And only Apple-1 of the first batch got many times the handwritten number on the back. Because they are several months older many collector trying to get these boards. For example Mike Willegal created a replica mainboard of the Apple-1 mainboard and used the early version of the first batch as a reference. The differences between both versions are easy to spot. 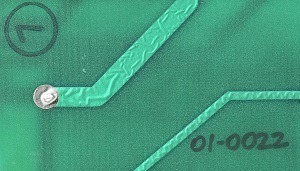 The second batch has a rhombic logo with letters NTI inside under the 'Apple Computer 1' logo and was produced second half of 1976. Decoupling capacitors are square shaped multilayer capacitors (usually green). Mainboard of 1st batch have round ceramic capacitors. Some NTI boards have different electrolyte capacitors. Usually they are blue but some NTI boards have one or more golden colored capacitors. PIA and CPU on boards of 1st batch have sometimes ceramic chips. Mostly the CPU. Many boards of 1st batch have the plastic AMI PIA. On second batch only plastic chips were used but some owner changed it later to ceramic version for better looking. So far, Apple-1 of 1st and 2nd batch have seen very high results at auctions in the past. The number of pre-production and hand wired Apple-1 is unknown. Probably and unfortunately no such Apple-1 survived. The so-called 'Celebration Apple-1' is not an pre-production Apple-1. Some Apple-1 were traded in for credit on Apple II. The credit offered was not a great deal. As an example, see the letter from Fred Hatfield. He turned it down. The only person that I've came across that actually have done a trade-in was Bob Bishop, famous Apple II programmer. I exchanged some emails with Bob recently, and he doesn't remember what he received. He does think it was along the lines of what Fred was offered. There are a couple of units in existence that were probably traded in. These are the two that the Huston brothers took from the pile in Steve Jobs office. Although there are stories of many Apple-1 being traded in for Apple II, I have found evidence of very few actual trade-ins. Early on in Apple history, there was a stack of Apple-1 that were initially in a cabinet in the lab and later on, moved to Steve Job's office. Depending on which early Apple employee you talk to, the stack was either large or small in size. The best take on this is that there was a modest number of individual units in the stack, but that took up a large amount of vertical space, due to the height of the heat sink. There were two categories of units in this stack. In addition to a few units that were traded in for credit on Apple II, there was a number of unsold Apple-1 that were never populated with chips and tested. A number of early Apple employees were allowed to take one of these boards home. All of the unsold units were NTI boards and had no chips in the sockets. Some have been populated and brought to life since that time. Since not many people know the story of the unpopulated/unsold boards, when encountering these boards, people usually speculate that the chips were pulled from the boards after being sold. Confusion about the name: Apple-1, Apple 1, Apple-I, Apple I? Even Apple Company used different names in advertisements and price lists. On the mainboard, it is Apple Computer 1. In price lists, it is Apple I. There is no right or wrong name. On early ads and on the manual, however, it is Apple-1 and Steve Wozniak preferred it like this. These reasons are enough for me to use Apple-1. Some people argue it should be Apple II. Well, correct would be Apple ][ and even the third Apple was Apple III. The name always had an artistic touch. Why is so often the protective coating on the mainboards tracks bubbling/peeling/wrinkled? Apple-1 mainboards are wave soldered. Wave soldering is very effective and low cost but it has its downside. Adhesion between tracks and board on wave soldered boards can get loose. So far I have never seen any Apple-1 with this problem. But you can see on almost any Apple-1 board something looking like wrinkled protective coating on the tracks (sometimes it looks like a wave). Typical peeling. That is caused by wave soldering and the age of those boards. The high temperature at wave soldering is responsible. The Apple-1 use the 6502 CPU, mostly MOS 6502. Some CPU are in ceramic housing. Mostly white ceramic. Others are in an plastic housing. At first Steve Wozniak had the idea to use the 6800 processor from Motorola. The 8080 was too expensive for him. 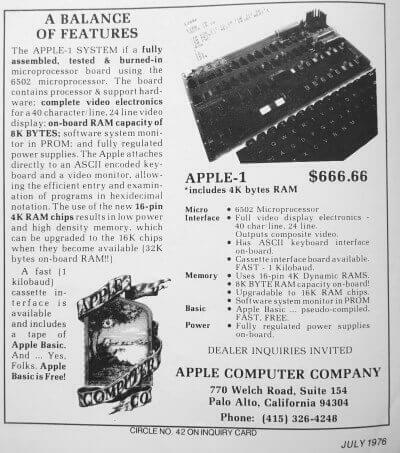 But even the 6800 was pricey. Steve Wozniak liked the Motorola 6800 because it was used in some of his favorite minicomputers. His friend Allen Baum discovered the 6502 in MOS Technology ship for Steve Wozniak. As soon as he got hands on the 6502 at Homebrew Computer Club he changed his plans and used the much cheaper 6502. With just 25 US$ extremely cheap in 1976. Sometimes this chip is white or purple ceramic, sometimes plastic. Manufacturer is MOS. Used as an interface for keyboard and display. Sometimes this chip is white or purple ceramic, sometimes plastic. The PIA got the number 6520 and Motorola used 6820. Later 6521 was used as a substitute. Many times PIA from AMI, Synertek or Motorola are used for the Apple-1. AMI was widely used in the first batch of Apple-1. The memory for the computer. Memory can be found in ceramic and plastic housing. 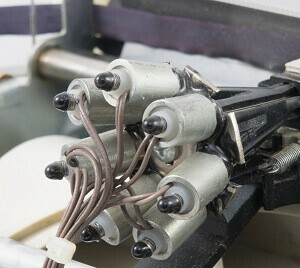 Most common is the plastic housing. DRAM was a large step forward. Many computer used SRAM. 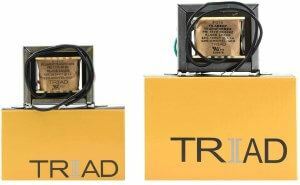 SRAM was more expansive as DRAM. Every chip got 4096x1 bit = 512 byte. In an Apple-1 8 are used for one row = 4 Kbytes. 4 or 8 KBytes are used for Apple-1. With some modification it is possible to use more memory. But you have to do add wires and some election parts by yourself, only for experienced people. 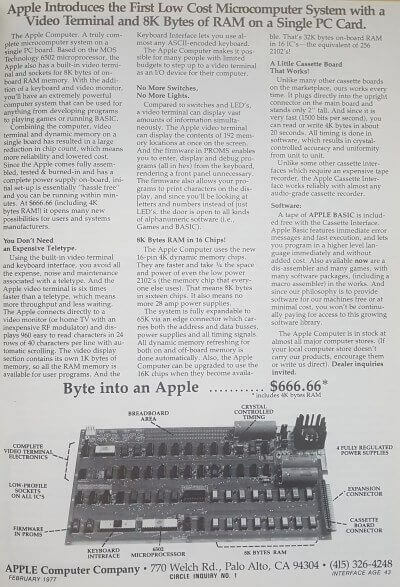 According to Apple ads even 65 Kbytes are possible. The firmware of the Apple-1 is stored in two PROMs 256x4 bits. Woz (Steve Wozniak) Monitor program is stored in just 256 bytes and enabled to use the keyboard to enter commands and machine code for 6502. 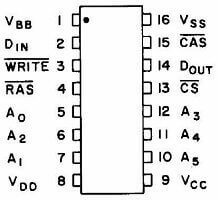 PROM is non-volatile Programmable Read-Only Memory a type of ROM. There was no reset circuit. You need a reset circuit to get the computer started. So you need an extra switch. Original and not modified Apple-1 can only use upper case characters. Everything was squeezed in this tiny memory. 254 of 256 Bytes are used. Good job! MOS - MOS Technology, Inc. This company produced the CPU 6502 and the PIA 6520. Most Apple-1 use MOS 6502. Produced the CPU 6502 and the PIA 6820. Produced the CPU 6502 and the PIA 6520 as well. Most DRAM used in Apple-1 was manufactured by Mostek. Major manufacturer of integrated circuits (ICs/Chips) widely uses for computer. The large capacitors used for Apple-1 are eye-catching. Producer was Sprague Electric. The original Apple-1 was just a mainboard – nothing else. 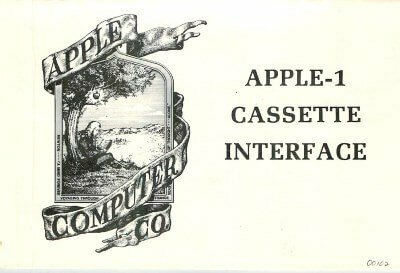 Just one exception: Steve Wozniak created afterwards the Apple-1 cassette interface. It was sold for US$ 75. Everything else was up to the owner. For this reason, there is no original Apple case, keyboard etc. And don’t even think about a mouse. There was no power supply. Apple-1 owners had to find a solution by themselves. Usually two transformers are used. 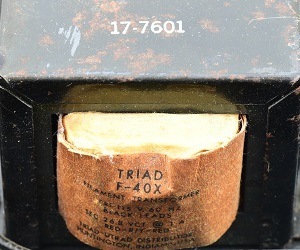 Most Apple-1 owners used Stancor (P-8380 and P 8667) or Triad (F-31X and F-40X) transformers as recommended in the Apple-1 manual. All wiring was up to the owner. Ready-to-use solution were offered by some shops and Apple dealer. No keyboard was ever offered from Apple Computer for the Apple-1. Many Apple-1 owners in 1976/77 used Datanetics keyboards. The Apple-1 needs an ASCII keyboard. Later on and even today, many Apple-1 owners used Apple II keyboards. No case at all! Apple never offered a case for the Apple-1. The Byte shop offered wooden cases handmade by Randy Wigginton's father from California. Randy Wigginton was Apple employee #6. Most owners just used the computer without a case or had chosen custom made cases. Owners were pretty creative when it came to the case: wooden case, plastic case, metal case, 19 inch rack, briefcase or even just a wooden board. One Apple prototype case exists and belongs to #70 in the Apple-1 Registry. 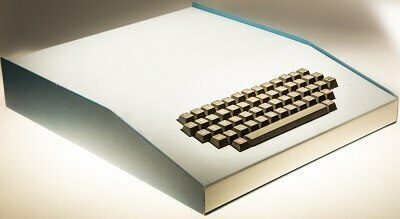 Until 1985 this prototype case was in Steve Jobs' office. 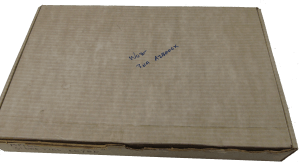 The Apple-1 was delivered in a simple white cardboard box. On 1976 photos a stack of boxes in the room of Steve Jobs sister is visible. A view boxes got some writing or sticker on top. Apple did not offer any monitor for the Apple-1. Some owner used monitors, some TVs. Some owner used an RF modulator to get the signal through the antenna connector. A wide selection of different monitors/TVs were used. Some famous auction pictures show a square monitor, the Sanyo VM-4509 or Sanyo VM-4209. For this reason many people believe that this would be THE monitor for the Apple-1. But it is not. It is just one possibility. 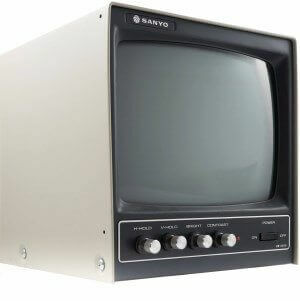 The Sanyo monitor was shown at many auctions and maybe for this reason so many people believe it is the 'correct' monitor. Many pictures of 1976 or 1977 showing TV screens used with the Apple-1. Even pictures at Jobs' house and at First West Coast Computer Faire showing ordinary TVs. 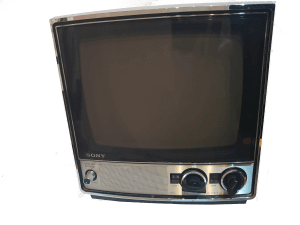 Steve Jobs wrote about the Sony TV 115 in a letter to Electric City Radio Supply. Optionally there was an interface for tape recorders available for US$ 75. It was plugged into the free slot. There were basic and games on cassettes. 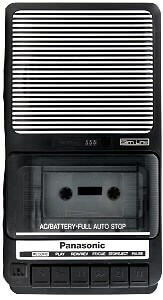 This cassette interface was developed by Wozniak. In 1976 the speed of 1200 baud was considered fast. Anyway, loading programs from a tape recorder could be quite tedious. The data transfer was not particularly reliable. Later it was discovered that the replacement of a 10nF capacitor with a 100nF capacitor make it considerably more reliable. 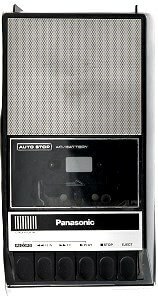 Again, many people believe the Panasonic RQ-2102 would be THE cassette recorder for the Apple-1 just because many auction pictures showing this recorder. But this type was manufactured years later. It is just a better solution than the one Apple-1 owner had to use back in 1976. Back in 1976 Panasonic RQ-309DS was available and recommended by Apple. Memory was limited to 4 or 8 KB but it was possible to upgrade it by yourself. This was not an easy task and only a few owners added more memory. For some Apple-1 this additional memory was later removed to make it look more original for auctions. It is up to you to judge if this is good or bad. Just a few owner tried to use a printer with the Apple-1. 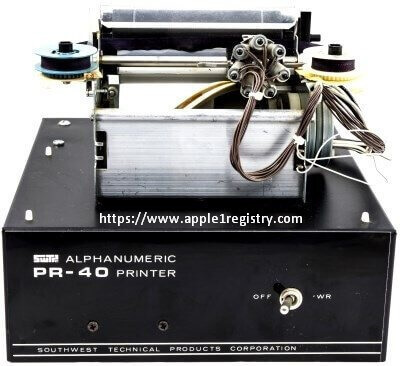 Steve Jobs wrote an article about the SwTPC PR-40 printer and how to use it with an Apple-1. The PR-40 have 40 columns. The paper width is 4 inch. Some owners created additional hardware for the Apple-1. Some were added directly to the mainboard and others were added by using the expansion connector. KIMSI was an additional board made for KIM-1 computer and was compatible with the Apple-1. The KIMSI allowed to add S-100 cards. S-100 was some kind of standard in the 70’s and for example used in Altair and IMSAI computers. Some users even added a Teletype to the Apple-1. Another nice addition was the GT-6144 Graphics Board. This board made it possible to use monochrome graphics. Well, graphic resolution was only 96x64 pixels. Not many software for the Apple-1 exist. Apple Computer itself had only a few cassettes to offer. Today it is very comfortable to use music player instead of cassette player. All software for Apple-1 can be found as sound files. You can record those files on tapes or use modern music player. Try this Apple-1 Emulator ! You can even load programs. But you need some knowledge how use the Apple-1. To use software, you have to load from cassette or music player by typing on your Apple-1 the command C100R. Next you have to type a individual code to start the program. Type the code, start cassette or music player and hit enter. You need passion because it take some time to load. Last step is to type a code to start the program. For example to start BASIC you have to enter E000.EFFF. This will load the software. After loading type E000R. Some documents were offered by Apple Computer. If you would like to get hands on it you may find scanned documents. Two different versions exist. 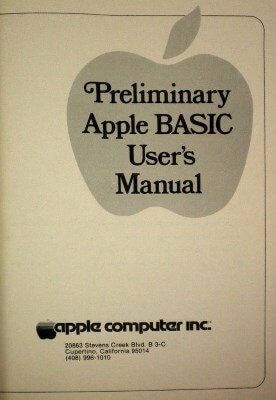 First manual shows the first Apple Computer logo (Newton under the Apple tree ). Second has an Apple on front cover. The manuals containing schematics of the Apple-1. Two different versions exist. 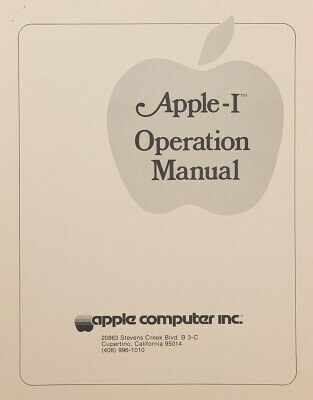 First manual showing the first Apple Computer logo (Newton under the Apple tree ). Second got an Apple on front cover. Until around April 1977 the Apple-1 was listed in the official Apple Computer price list . Apple and some computer shops had placed advertisements since July 1976. Some newspaper articles have been published. The new computer magazine Kilobaud published another article in February 1977. Steve Jobs wrote an article about how to use the SwTPC PR-40 printer with an Apple-1. Steve Wozniak published several articles as well. First presentations happened at the Homebrew Computer Club. At the PC-76 show in Atlantic City Apple was present. 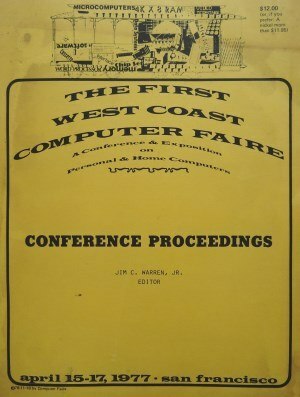 At the First West Coast Computer Faire Apple had a stand and was successful in selling computer. Zaltair was a prank done by Steve Wozniak and Adam Schoolsky. Steve Wozniak loves jokes and pranks. 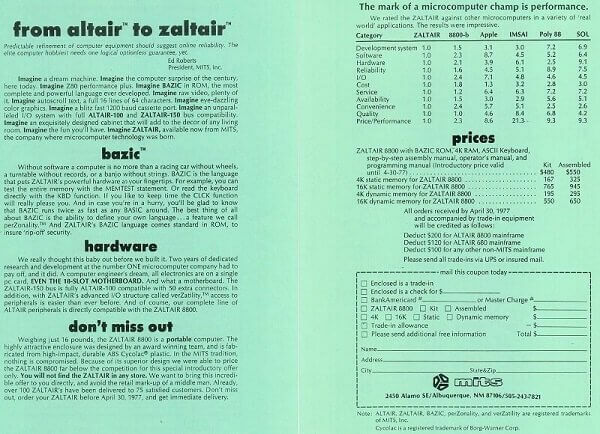 At the First West Coast Computer Faire he had many copies of a brochure advertising the fictional computer called Zaltair. MITS, the company building the Altair didn't like this brochure very much. Some other Apple-1 related documents exist. For example bills, letters and postcards from Apple Computer. Product information for Apple-1 and Apple II exist as well. A few bills still exist. Those bills are handwritten. 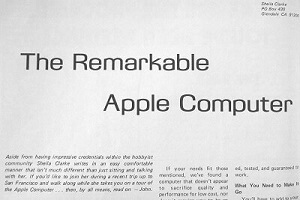 The Apple-1 and the young Apple Computer company were shown in some computer magazines. 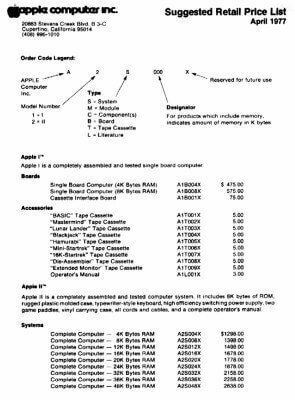 A one of a kind Apple-1 related document is the Apple Computer contract.Every founder has one and Ron Wayne sold it. 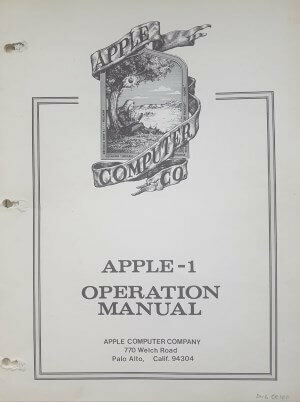 Later in history numerous books and articles were written about the Apple-1 and the young Apple Computer company. Many can be found in your favorite book store in many languages. Links to the owners of Apple-1 Computer you may find in the list of all Apple-1 and in the map. Bill Fernandez, Apple employee #4. He introduced Steve Wozniak and Steve Jobs to each other. Randy Wigginton, Apple employee #6. His father handmade the wooden cases offered by the Byte Shop for the Apple-1. Daniel Kottke, Apple employee #12 (but he was the first to help in Steve's parents' home to assemble the Apple-1) and a close friend of Steve Jobs. Dr. Wendell Sander, Apple employee #16. Worked on Apple II and designed Apple ///. Website got plenty information about early Apple history and some peripheral boards designed by Wendell Sander. 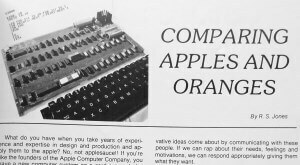 Achim Baqué's website with information about the Apple-1. Curator of the Apple-1 Registry. If you would like to get your website listed here, contact me. Only websites directly related to Apple-1 computer will be added here. Anything related to one specific Apple-1 will be added in the registry section. This link list should not be overloaded.